Zhuang Huagui (26), from China, held a special wedding ceremony at the funeral of his fiancée Hu Zhao(21), on February 4, 2010. 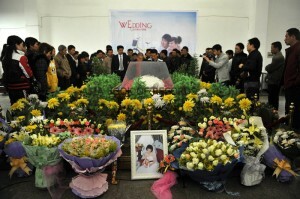 The couple originally planned to get married on February 4, 2010, but on January 28, 2010 (one week before their wedding), the girl was stabbed to death by two break-in thieves. Comments for WEDDED TO THE DEPARTED SOUL are now closed.